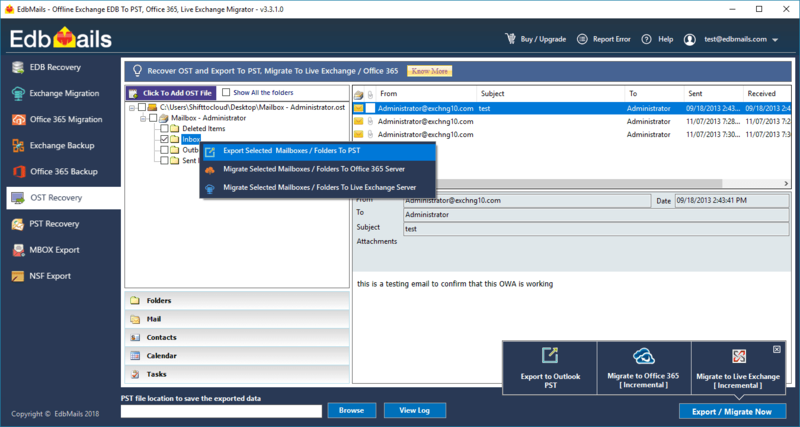 How to export Exchange OST file data to a PST file using EdbMails for OST to PST conversion? I would like to preview the OST file data prior to continue with conversion operation. How do I do that? How can I export OST file to PST file using the demo / trial version of EdbMails free OST Recovery? Do I need to download separate setups for OST to PST, OST to Office 365 and OST to Live Exchange Server Migration? Should I have Outlook installed on the computer where I'm running EdbMails for OST recovery? How do I export Mailboxes / Folders to PST files using EdbMails? How do I save selected Mailbox folders into PST file? Do I need to convert Exchange OST file to PST file? Why? How long will it take to the application to export OST to PST file? Can I Export the OST file using OST Recovery with EML, MSG, RTF etc., file formats? Can EdbMails repair and recover corrupted / damaged OST file? Do I need to contact EdbMails Technical Support if I face any issue in OST conversion? How can I take backup of Exchange server using EdbMails OST converter tool? Does the application convert OST file to PST file that is not connected to Exchange Server? Does Exchange server services are required to be running to convert OST file to PST? Does OST to PST conversion require original Outlook profile for recovery? Is there any limitation on OST file size for converting it to PST file? Does EdbMails extracts mails from the OST file which is having Non-English (Unicode) characters? When we try to open the outlook we are getting an error "default outlook profile.ost is in use and cannot be accessed"? 2. Open EdbMails application and login using your login credentials. 3. Select Export Exchange OST file option and browse the OST file that you wish to recover. 4. Select the entire Mailbox or folders from the tree view. 5. Click on the button 'Export Selected Mailbox/Folders...' to execute OST converter. 1. Open EdbMails application and login with your credentials. 2. Select Export Exchange OST file option and Browse the OST file that you wish to recover. 3. EdbMails OST converter application will scan the entire OST file and list the mailbox folders in the tree view. 4. Click on the folder to preview its mail items and other details. In demo version of free OST Converter, you can export upto 30 mail items from each and every folders of the entire mailbox. Including contacts, Calendars Notes, Tasks etc can be exported. No. There is only ONE EdbMails Setup comprises of all the functionalities such as OST to PST, OST to Office 365 and OST to Live Exchange Server Migration. It is recommended to install recent version of Outlook before you start exporting emails using EdbMails for OST recovery. Right click on the Mailbox or Folder that you wish to export as shown in the below screenshot. Right click the folder (Inbox, Outbox, Sent Items etc.) that you wish to save into PST file and select the popup menu item "Export Selected Mailboxes / Folders to PST / Office 365 / Live Exchange" to save the emails into PST file. - If your Exchange server is crashed or the Mailbox on the Exchange server is deleted, you need to access the emails. - If you need to migrate emails to a different server. - If MS Outlook is not getting synced with Exchange server etc. EdbMails is one of the high performance oriented OST to PST converter application. However, the total time required to complete the export is depends upon the number of email items (Contact, Calendar, Tasks, Mails etc.,) in the OST file. EdbMails OST recovery tool can Export the OST file in EML, MSG, RTF etc., file formats. EdbMails OST converter perform any action on corrupt OST file (it recovers OST from most of corrupted condition). This tool converts corrupt OST file into working PST file which you can easily view in MS Outlook to access all your OST file data. If you face any issues during the export or after the export, you can contact our Technical Support. Take a backup of your Exchange server by converting the OST file to PST file and save it. EdbMails can convert Offline (OST file which is not connected to the Exchange Server) OST file to PST. Exchange server services are not required to Convert OST file to PST file. EdbMails OST converter doesn’t require original Outlook profile for performing the conversion. There is no limitation or restriction on the size of the OST file to convert it to PST. You can export the OST file of any size. Yes. EdbMails is designed to support OST file with all the English and Non English (Unicode) characters. If you observe any character conversion issue, you may change your "System locale" to "English" and verify. 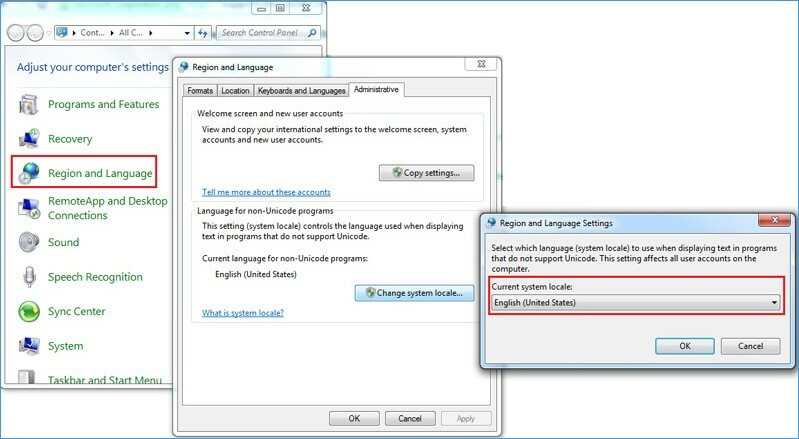 Refer below screenshot to set the desired System locale using "Region And Language" option which is present in your system Control Panel. Solution to Fix the Error : "default outlook profile.ost is in use and cannot be accessed"